Comprised of three main activities, Sarari is an intervention created to increase community support for modern family planning methods in Niger. 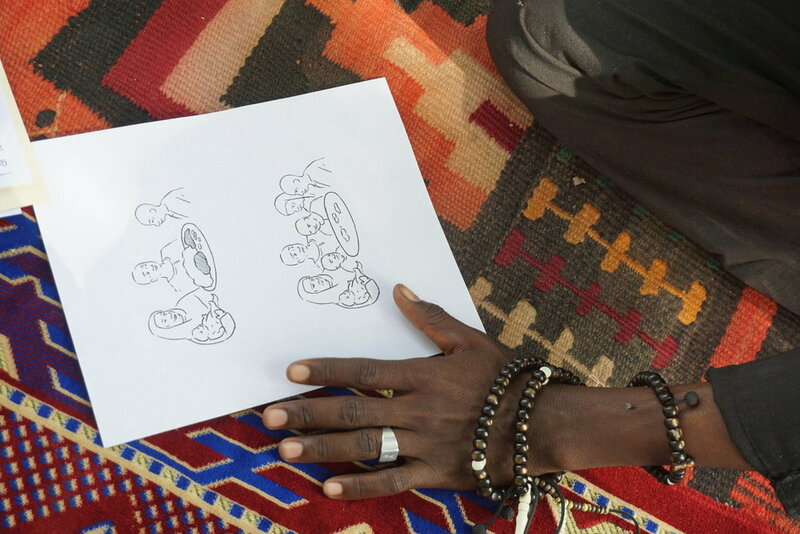 After extensive design research and prototyping, the program is currently being piloted in five villages in the Zinder region of Niger and has seen promising results. Niger has the highest rates of adolescent marriage and fertility in the world. Women have an average of 7.2 children, which can lead to higher rates of poverty and maternal and child mortality. Most women in the country know about contraceptive methods and how to access them, but due to social and gender norms, they typically don’t use modern family planning options unless their husband allows it. After ideation, prototyping, and rapid iteration, YLabs worked with community leaders to develop the three complementary components of Sarari that would increase community support for using modern contraception for birth spacing. Leaders Engagés are structured collectives of religious leaders who act as agents of change. They are trained by their peers to speak on the importance of birth spacing for maternal and infant health and overall family well-being during religious services, while teaching at Koranic schools, or during private consultations. Séminaire des Leaders are a series of debates that take place between religious and youth leaders to dispel myths and misconceptions about family planning and birth spacing. In this forum, these two influential groups are given the space to engage in candid discourse about family planning and birth spacing. All materials needed to be created for low literacy populations, which presented a unique design challenge. While the initial focus of the program was religious leaders, through our design research we discovered that there was an enormous need to focus on young men who had a more direct influence on the reproductive decisions of their wives. Men make decisions about money, the number and timing of children, and whether or not their wives use contraception. However, through interviews with young men in the community, we realized that they weren’t considering the financial implications of having multiple children. Dede Ruwa Dede Tsaki is a Hausa proverb that translates to “just the right amount of water for the flour” and expresses the need for balance. This component of the Sarari program combines a financial planning and budgeting exercise with visual messaging drawn from the Koran and the commentary of the Prophet (Hadith) that supports birth spacing, informed decision making, and a balanced quality of life. To date, 555 men and 14 women have participated in the pilot, and midterm findings indicate that Sarari has the potential to create a supportive environment for reproductive health that is accepted and cherished by religious leaders, community members, and young couples. 79% of participants have reported a 50% reduction in the number of children they desire following the financial planning exercise.